Wyoming has millions of federal acres under lease for oil and gas production. 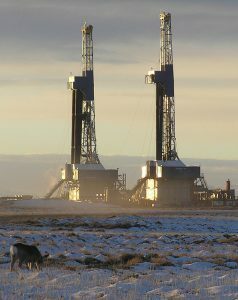 2006 Photo by BLM – Wyoming. A federal judge says the Bureau of Land Management must take a harder look climate change impacts before issuing oil and gas leases. The case stems from lease sales in Wyoming during the Obama administration. But if the ruling stands, it could complicate the Trump administration’s effort to produce more petroleum from public lands in Alaska and the West. U.S. District Court Judge Rudolph Contreras in the District of Columbia issued the ruling Tuesday night. The judge said it’s not enough to consider the impact of each drilling project on its own, given the cumulative nature of climate change. He also said the BLM must consider the greenhouse gases emitted later, when the fuel produced on the federal land is consumed. He has ordered the BLM to amend its environmental analyses but he did not throw out the leases, suggesting that the problems he found could be corrected with more paperwork. The BLM did consider greenhouse gas emissions when it analyzed potential oil lease sales in the Arctic National Wildlife Refuge. That study will almost certainly be challenged in court, too. A group of attorneys-general from 15 states and the District of Columbia has filed a lengthy memo alleging the BLM is underestimating the climate impacts from development in the Arctic Refuge. For one, they say the BLM wrongly assumes the oil produced from ANWR oil will almost completely replace oil produced from somewhere else.